Archery was a favourite sport of Miss Moore. 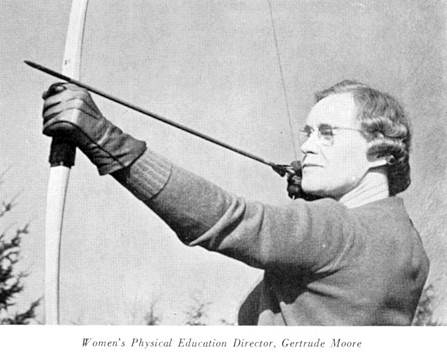 She taught women at UBC during her tenure there and so it was a natural extension to include it as one of the activities at the camp. Campers reminiscing about their experiences at Moorecroft, pre-war and later when it was owned by the United Church often included it in their memories. Do you remember learning the basic techniques of archery and hitting your first bulls-eye (or not)? Leave a comment below, noting the year(s) that you were at the camp.